Okay, maybe this one is obvious. It’s also the easiest. But if you are only using 1 pound of clay and trying to make a 12″ tall vase, there isn’t much else you can do to make it work. 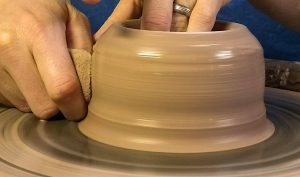 Plus it’s usually quicker to cut off a little extra clay from the top or bottom before you take the pot off the wheel than it is to start over. 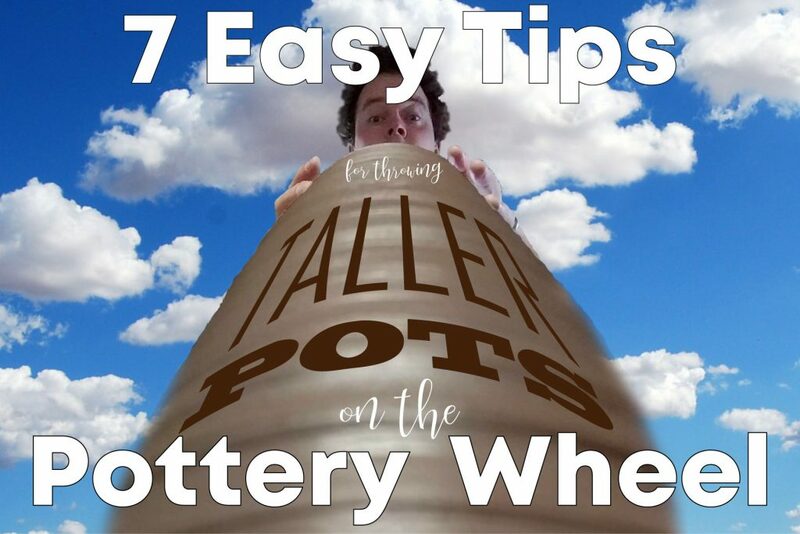 As you throw taller pots more often you’ll get a better idea of exactly how much clay you need. One thing that I’ve noticed is that when I work with clay that is a little stiffer, it is easier to throw taller pots on the wheel. This makes sense. As the clay dries out, it becomes stronger and can support more weight, even if it is thin. Think about attaching pieces of clay together. If the pieces are leather hard it will be much easier than if the pieces are very soft and flop all over or collapse. Of course, there are trade-offs. Stiffer clay takes more effort to center. Stiff clay is also harder to manipulate. There are so many different kinds of clay and they all have unique properties. Some types of clay are better for throwing, especially for throwing taller pots. If you have the chance, try working with some different kinds of clay to see if there is a better option for you. Water is necessary when you are throwing pottery on the wheel to reduce friction and stop the clay from getting stuck to your hands. But as you add water it gets absorbed by the clay. This makes your clay softer and more likely to collapse. Try to use the least amount of water possible. Instead of squeezing a whole sponge full of water on your pot, try to squeeze a tiny amount and see if it is enough to make a full pull of the wall. If not, add a little bit more the next time. Keep adjusting until you get just the right amount with no extra water. Personally, I hold the wet sponge in my outside hand as I pull so it wets the clay just above my finger that I apply pressure with. That way I don’t have to put a bunch of extra water on the clay. It will also be helpful to make as few pulls as possible as you form your pot. Less pulls of the wall means less water needed. To make less pulls let’s see if there is anything we can improve about our throwing technique. One thing you want to avoid any time you throw pots is to leave a bunch of extra clay at the bottom of your pot. This is especially important for throwing tall pots because this extra clay is needed to make the pot go taller. Make sure you are squeezing enough at the bottom when you start your pull. One thing that surprised me as I was learning to throw pots was how much clay could be squeezed up from the bottom. Be warned though, if you make the wall too thin at the bottom right away it won’t be able to support the rest of your pot as you pull up the walls. 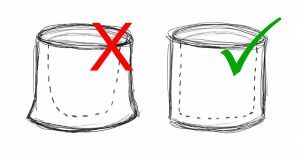 Your pots should have even wall thickness for the most part, especially if you are throwing tall pots. To get even walls you need steady consistent pulls. There are a few things that have helped me to achieve this. Full Pull: don’t stop half way through a pull. If you stop and start too much you may end up with thin spots. These places are more likely to collapse as you continue to pull up the walls. Make sure you are in position to make complete pull from bottom to top. For me, this means I’m usually a little higher than the pot and leaning over it slightly. Steady Hands: keeping your hands steady is probably the most important thing for even walls. For me, this includes bracing my elbows against my hip or ribs. I try to focus on keeping my hands steady instead of thinking too much about the clay. Strong Point of Contact: some potters prefer to throw with their fingertips. I usually use my fingertips when I throw smaller pots like mugs or cups. I get a better feel of the wall thickness that way. But when you are throwing large pots it may be a better idea to use your knuckle or even the palm or heel of your hand. 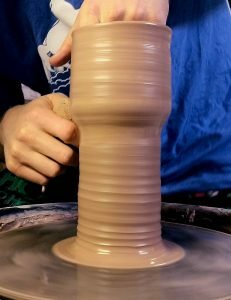 If I try to use my fingertips to throw a tall pot it is a lot harder to squeeze the clay consistently all the way from bottom to top. My fingers move too much when I try to control the amount of clay that I need for a taller pot. And I start to get a cramp in my hand after a couple pulls. I switch to my knuckle for big pots. Plenty of outside pressure: Make sure you are pressing firmly with your outside hand as you lift your hands to pull up the wall. The spinning clay wants to go outward and make your pot wider. The wider you make your pot the shorter it will be. It actually feels like you are pulling the wall slightly in as you pull it up. Most potters keep their outside hand slightly below their inside hand as they pull up the walls. Your top, inside hand pushes the clay outward and then your bottom, outside hand lifts the clay and pushes it back in. As you can see in the image, your pot may get thinner as you make each pull. The last thing that has helped me to throw taller pots is to focus on the cylinder first. I focus on getting the walls straight up with an even thickness before I start to shape my pot. If I start to shape the pot too much before I get the walls all the way up, I end up with thick or thin spots in the walls.